Vivo is coming with the latest APEX smartphone in 2019. Yes, Vivo APEX 2019 will be unveiled on January 24, 2019. The brand first introduced couple of APEX smartphones last year and those were popular online and offline, specially Vivo NEX and Vivo X21 and on. Few other brands also introduced them such pattern later. So, this time Vivo is coming with "To Simple Future" slogan. Also, "to wake up to the future" theme. As per the official detail available, this is yet another groundbreaking innovation in smartphone technology with #VivoAPEX2019 - and the phone would possibly come with a liquid metal chassis without any buttons. As per the source, Vivo APEX 2019 model number would be EKI1831 and it would come with in-display fingerprint sensor beside other high-end features. The phone comes in a glass body, no ports or buttons and uses a magnetic charger with entire-screen fingerprint unlock features. 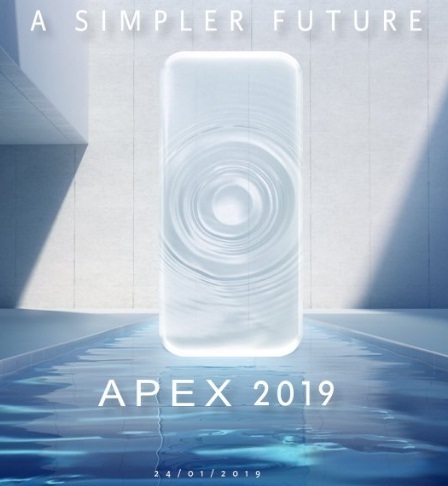 If you wanted to know when Vivo APEX 2019 smartphone will be launched and what would be the price of Vivo APEX 2019 mobile phone etc. then you could see them very soon. You can see the cell phone after 24th January 2019 in real. In case if you are looking for Vivo APEX 2019 phone's key features, technical specifications, price, first impression, unboxing, review, comparison and hands-on etc. then you could find some or all of them over here very soon. So, stay tuned.